French Kitchen is a simple concept: authentic, high-quality, French bistro-style food served by friendly staff in the warm atmosphere of a French restaurant in Wandsworth. French through and through – the menus comprise delicious contemporary-styled classics, harnessing the experience of French-trained Chef and restaurateur David Healey. David and the team not only love great service and their diners, but they love the environment and the planet. 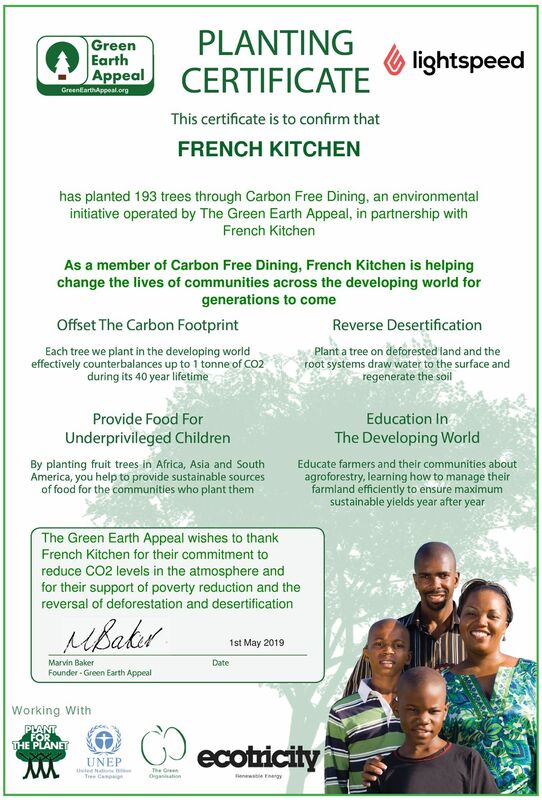 By empowering their diners to plant a life-changing fruit tree in the developing world, with each bill, French Kitchen and their customers are counterbalancing the Carbon Footprint and food waste of their meals, all while helping end poverty!